These instructions are provided as a guide to patients who have been diagnosed by a physician or dentist. These Instructions have been created after hundreds of hours of discussions with patients and physicians. They are not meant to be rigid and unchanging. Of course, we hope they work for you. But If they don't, please contact SQUIGLE, Inc. toll-free at 1-877-718-0718 (9 am to 5 pm EST). 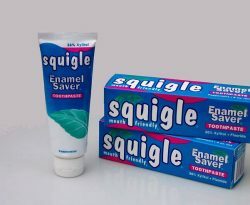 This is crucial: Use SQUIGLE® Toothpaste exclusively. Patented SQUIGLE is free of SLS (sodium lauryl sulfate) and other irritating ingredients such as cocamidopropyl betaine, tartar control agents, and bleaches. And it has a mild flavor to prevent irritation of delicate tissues. SQUIGLE has 36% Xylitol to prevent plaque and cavities better than regular toothpaste. If you feel you need to use mouthwash, use 0.12% chlorhexidine gluconate (a prescription antimicrobial rinse) twice a day, as needed. Floss at least once a day, before you brush. Use unwaxed floss. If your teeth are closely spaced, use Glide® floss. If your ulcers are too painful to use floss, use an oral irrigator. If possible, gently brush your tongue, roof of mouth, and inside of cheeks with a soft bristled, small headed brush. This will further reduce the amount of irritating plaque in your mouth. No baking soda -- it only makes matters worse. No chewing gum, especially no cinnamon or spearmint. One exception (see below). Don't use candy or breath mints, especially cinnamon or spearmint. For terrible attacks, try oral cortisone (methyl prednisolone dose pack -- prescription required). A short course of oral tetracycline is OK. So is a short course of antifungal therapy or antiviral therapy. Take a multivitamin + multimineral daily, after a meal. (Solgar VM-75® is OK). In addition, take 500 mg to 1000 mg vitamin C daily. Get sufficient rest each night. Visit an allergist to get tested for food allergies and sensitivities. Then avoid any foods you are allergic to or sensitive to.